Sized to fit an average width adult foot, any lenght! If you love the construction of a top down sock, but like the idea of using up your entire ball of yarn using a toe up method, you’ll love this pattern! 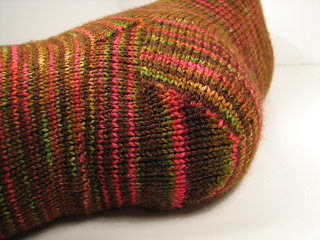 Hopefully you can use up any sock yarn in your stash to knit up these fantastic socks! Whether you are making ankle socks or socks with a long leg, you should enjoy knitting this awesome sock! This pattern is really easy to add whatever patterning you’d like to, just make sure you keep the same gauge! 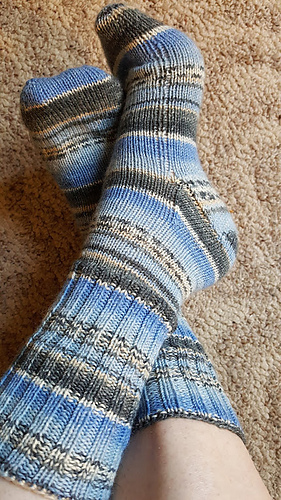 If you are interested in a more interesting sock, check out Erin of The Anatomy of Knitting’s Cabley Goodness Top-Down-Toe-Up Socks!